We have been developing and manufacturing loudspeakers since 1977. 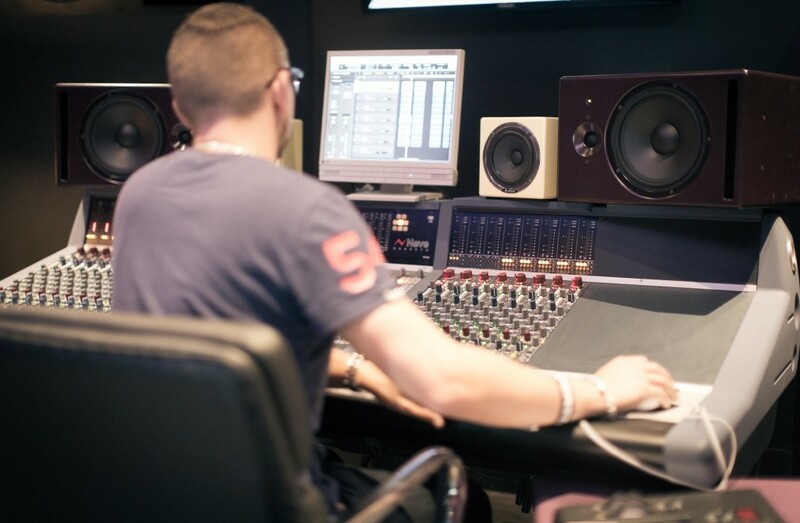 Our goal has never been to make a nice sound but to reproduce sound perfectly. Artists and sound engineers spend a lifetime improving their art and designing the best possible sounds for others to enjoy. We respect this. Therefore we only want to transform the electrical signal into an acoustic signal as accurately as possible so that the listener can hear and appreciate all the beauty and details. Most sounds are a combination of many different frequencies. Every note of an instrument will typically have a fundamental frequency as well as many harmonics. It is this combination of harmonics that will give each instrument (and sound) is particular timber. When reproducing sound, the frequency response of a loudspeaker is of course important and needs to be flat. It needs to faithfully reproduce the fundamental frequencies as well as all the harmonics to ensure the instruments sound identical. Flat frequency response ensures the timber of each sound is perfectly respected so that you can recognise each instrument. Flat frequency response is a good start but not sufficient on its own. Phase response and dynamic behaviours are also extremely important to reproduce a natural sound. When playing an instrument, the fundamental frequency and its harmonics all leave the instrument at the same time, travel through air and reach your ear at the same time. Imagine a snare drum. When it is hit, a multitude of frequencies will all leave the snare at the same time and reach your ears at the same time, giving you a sense of impact. Unfortunately, when going through any type of filter the frequencies are affected differently with the lower frequencies being delayed. This is most obvious with crossover filters but also true for all other filters be they electronic, acoustic or mechanical. To hear the same impact from a snare reproduced through a speaker, it is paramount for the phase of all frequencies to be identical to the signal. In other words, the frequencies of the signal need to be respected but so does the timing of the frequencies. Phase, or time coherence between frequencies, plays a very important role in sound location. We localise the source of sound from the difference in phase in the acoustic signal received between both ears. Location of sound source is also much more distinct on transients or impacts. An accurate sound stage requires accurate phase reproduction. We are sensitive to phase in frequencies with a wavelength that is the same order of magnitude as the distance between our ears, i.e. 20 cm. When wavelengths are much smaller, there are several cycles between what is received by one ear and the other making it difficult to identify sound source based on the phase. We are therefore more sensitive to the difference in sound pressure that phase in frequencies above 3000 Hz. When the wavelength is very long (several meters), there is only a very small phase shift over the distance that separates our ears. Furthermore, low frequency sound behaves in an omnidirectional manner. Therefore, we are not sensitive to phase below approximately 300 Hz. In between approximately 300 and 3000 Hz phase coherence plays a vital role in sound location. Our CPR system ensures phase is accurate above 150 Hz in our monitors. This ensures that transients are natural and dynamic and that the sound stage is perfect. It is very easy to get a loudspeaker membrane to move, but this movement needs to be perfectly controlled. It needs to accelerate and stop as fast as possible without creating any unwanted vibrations. A loudspeaker membrane is pushed and pulled by the coil in the magnet gap depending on the current that goes through it. The mechanical construction of a transducer represents a mass on a spring that naturally doesn’t behave the same way at all frequencies. It typically has a resonance frequency where it moves easier. Not only the transducer has resonance frequencies but also the material itself, the suspension, the spider, etc. It is important to know all these physical characteristics to be able to correct them with the electronics. So whatever the material of the transducer (paper, fabric, polypropylene or any other) it has to be accounted for in order to avoid any coloration of the sound. The material of the membrane should not colour the sound, all materials should reproduce accurately and not “sound” different. We have chosen material for their weight, rigidity, durability as well as homogeneity in production. In order to correct all of these physical characteristics we have implemented a feedback loop from the speed of the transducer and acting on the output impedance of the amplifier. 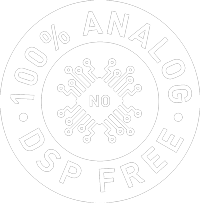 Needless to say that this circuitry is impossible to function in real-time with any digital technology and only analogue circuitry will achieve a perfectly seamless result. Our AOI technology ensures that there is no colouration of the sound from the transducers and that the transients can be perfectly reproduced. 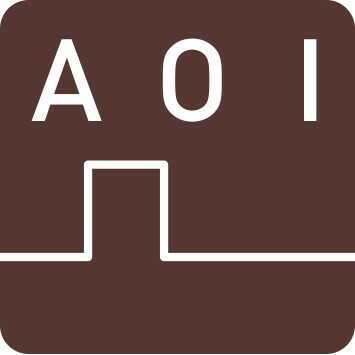 A good illustration of the result of our CPR and AOI signal is introducing a square signal into the speaker and seeing what comes out. In real life only sine waves exist. To create a perfectly square signal an infinite number of sine waves is necessary and all must be perfectly positioned in time. Imagine trying to fill the corner of the square signal with sine waves, you would need many sine waves, smaller and smaller, but all positioned accurately in time. As shown in the illustration below, a standard loudspeaker response might reproduce the frequencies used in the square signal but the timing is not respected as the low frequencies are delayed by the filters (acoustic, mechanical and electronic). As a result, the loudspeaker will start reproducing the high frequencies and the low frequencies will follow, then the high frequencies will stop and the low frequencies will stop slightly later. With our CPR phase compensation, all frequencies above 150 Hz are time aligned and it is possible to reproduce a square signal and sharp transients in any sound much more accurately. Of course it would be possible to compensated phase down to 20 Hz. However, as we have seen, we are not sensitive to phase below about 300 Hz and furthermore this would mean adding delay and latency in the system. It is generally considered that a latency in the loudspeaker of 1 millisecond is the maximum acceptable. Of course, when listening to music at home, there is no issue with a slight delay between pressing the play button and the music coming out of the speaker. But the latency must be very low when monitoring recording, mixing or in postproduction. Our largest speaker has a latency of only 0.6 milliseconds, which suffices to align phase down to 150 Hz. This latency is the same as moving the listening position back by 20 cm as it will take sound 0.6 milliseconds to travel that distance. All our technology is 100% analogue in to out. In the early 1990s, we when we starting developing active speakers, we had to decide between analogue and digital technology. The advantage of digital technology is its flexibility. For example, changing a complex filter can be done by typing on a keyboard. The disadvantage is that it requires chopping the signal up into small elements of time as assigning a pressure level to each one. The sampling rate can be very high (44’100 samples per second on a CD and much more in master recordings) and the number of possible sound pressures can be very high (65’536 when coded with 16 bit and 16 million with 24 bit). It is not the amount of possibilities that is the issue but getting them all right, timing in particular is tricky. Also each conversion to and from analogue to digital adds latency in the system and prohibits any feedback loop. Anything that can be done with digital technology can also be done with analogue technology. Digital technology has advantages when recording data or processing data, or in other words when things change. A loudspeaker has one single duty during its entire life (many decades for PSI Audio) to reproduce an acoustic signal from an electric signal. All electronics in a loudspeaker can therefore be done with analogue technology. However analogue technology requires very smart architecture to minimise the amount of components necessary and also requires having extremely accurate components. This is why we measure all components before using them and individually match the sensitive components on each print. 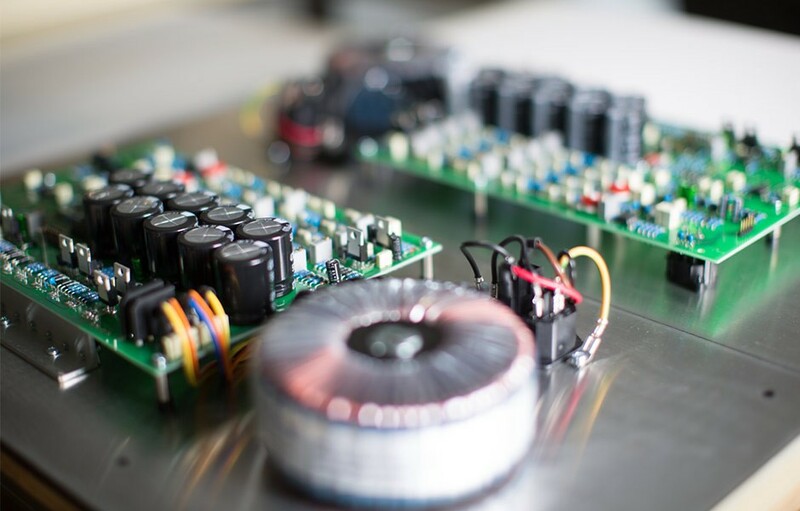 We thoroughly test and pre-calibrate our electronic boards before mounting them in a speaker to ensure all components on each board all work together perfectly. Don’t forget, humans ears are analogue and they work fantastically well. Sound can only be analogue. A loudspeaker membrane can only move in an analogue way. 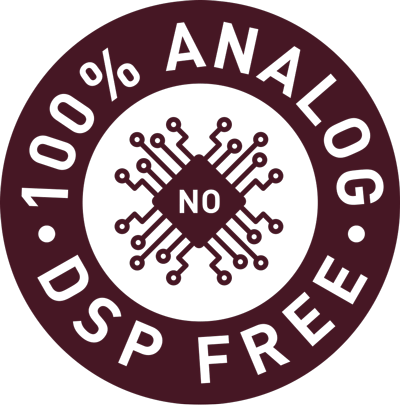 Most people will spend a lot of money and time choosing their digital to analogue converter. Why would they then accept 2 extra conversions in their speakers? Of course we use lots of digital technology in research and development where flexibility is important. A loudspeaker should transform an electric signal into an acoustic signal as accurately as possible in frequency as well as in phase with minimum distortion. As explained above, each electronic board is tested to ensure it is perfect before mounting in a cabinet. These electronic board account for all of the physical parameters of a standard driver. The drivers are complex mechanical assemblies of moving parts (membrane and coil) on springs (suspension and spider) with coils inside a strong magnetic field. This assembly has small variations such as: exact size, thickness and homogeneity of membrane, amount of glue, location of glue, thickness and shape of suspension, accuracy of voice coil, etc. Despite all efforts made to reduce variations to a minimum when producing drivers, individual measurement and adjustments are absolutely mandatory. 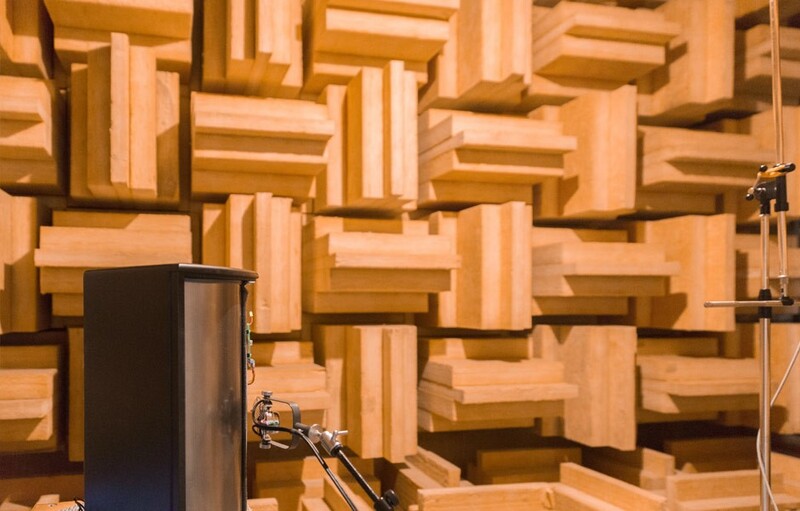 This is why we test and measure every single loudspeaker in our large anechoic room (160 m3). We measure frequency response, phase response, harmonic distortion and non-harmonic distortion (rub and buzz). Each of these parameters has tight tolerances that need to be respected. The calibration curve is then printed for each single monitor produced and acts as a ‘birth certificate’. Needless to say that this is done in laboratory conditions with accurately calibrated instruments as well as defined temperature conditions. It is impossible to ensure that electronics, drivers and cabinets all work perfectly together if you don’t measure them and calibrate them together in a well defined environment. Should you measure a Loudspeaker or listen to it? The answer is simple: both. There are details and parameters you can measure but not hear easily and there are details that are very difficult to measure but that can be heard. A loudspeaker should not sound beautiful but simply reproduce accurately beautiful sounds by transforming and electric signal into an acoustic signal. If you accept this and accept that the artist, instrument sound engineer, natural sound, or whatever you are listening to is what you want to hear, then you can measure many parameters on you loudspeaker such as frequency, phase, distortion, directivity, energy, impedance, etc. All these parameters can be optimised objectively but then it is necessary to listen to the loudspeakers with different specialists and in different environments. For each new development and improvement we have a panel of specialists who listen to our loudspeakers and work with them for a period of time in their environment. We like to include some classical musicians and producers, as they know exactly what their instrument should sound like. More subjective parameters are evaluated such as: transparency, dynamic behaviour, sound stage, colouring, comfort of listening as well as personal impressions. Then process is lengthy but necessary to validate any development or change. Once validated, we establish a reference that needs to be matched in production for every single loudspeaker, hence the individual calibration. People ask us if we match our speakers in pairs. No, we match components in each loudspeaker so each loudspeaker matches the reference that is as close as possible to reality and subjectively validated by hundreds of ‘listenings’. Amplification of the signal is necessary to drive the membrane and create loud enough sound. There are numerous types of amplifiers that all have advantages and disadvantages. In general class AB is considered to be the most accurate but it has the disadvantage of not being very efficient producing lots of heat that needs to be evacuated and also crates thermal stress on the components. We developed our own class AB amplifier that we use for the less energy intensive drivers such as tweeters. For most woofers we developed a class G/H amplifier that uses 2 different tensions and seamlessly travels from one to the other minimising energy used (and therefore heat). Not many people used class G/H amplifiers, as they are complex and difficult to get right. All our amplifiers also integrate our AOI system as a real time feedback loop. Note that we have developed class G/H amplifiers for other industries, such as prestigious precision mechanical industry, when they cant achieve what they want with any other amplifier such as class AB or class D.
Our world-class competencies are used in several other industries. 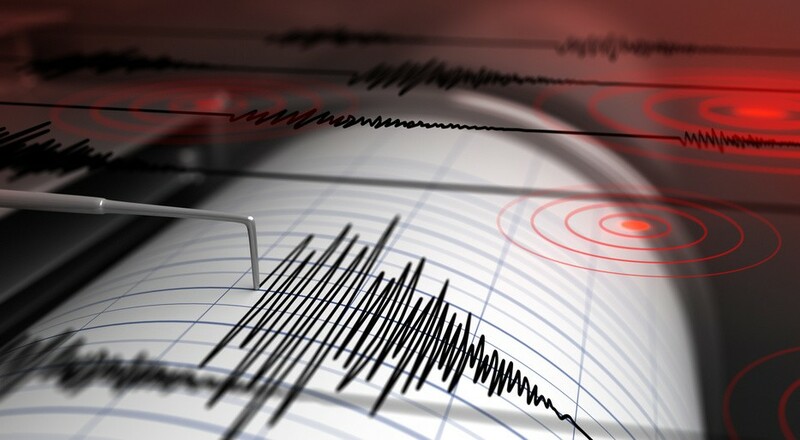 Building on our tweeter technology, we have manufactured high precision seismographs that measure vibrations on many European bridges. Based our class G amplifier technology we have developed special amplifiers for the Swiss precision mechanical industry. With our precision acoustic technology we developed small anechoic chambers used in the watch industry.